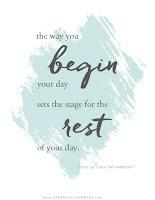 The way that you begin your morning has an incredible impact on how you feel and what you can accomplish during the day. 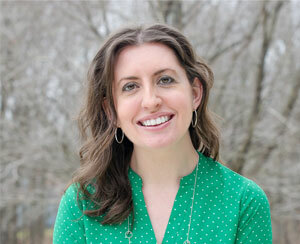 These seven tips will set you up for a calm and efficient start. More than ever, people seem stressed out and moving at mach speed before the day even gets going. 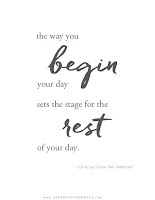 And as Emily Ley points out in her book Grace, Not Perfection , "The way you begin your day sets the stage for the rest of your day." If your morning is rushed and scattered, your day likely will feel the same way. And that could be one reason why many of us collapse into bed at night wondering where the day went and what we actually accomplished. Since the beginning of the year, I've been trying to find ways to add a little more calm to my morning and ease into the day in front of me. And honestly, it is making such a difference in my attitude, work ethic, motivation, and the mindset that I bring to the problems that may arise. Couldn't we all use a little more of that in a day? The responsibilities and chaos of daily life often leave you dreading what is ahead. You feel rushed and busy before the day starts. 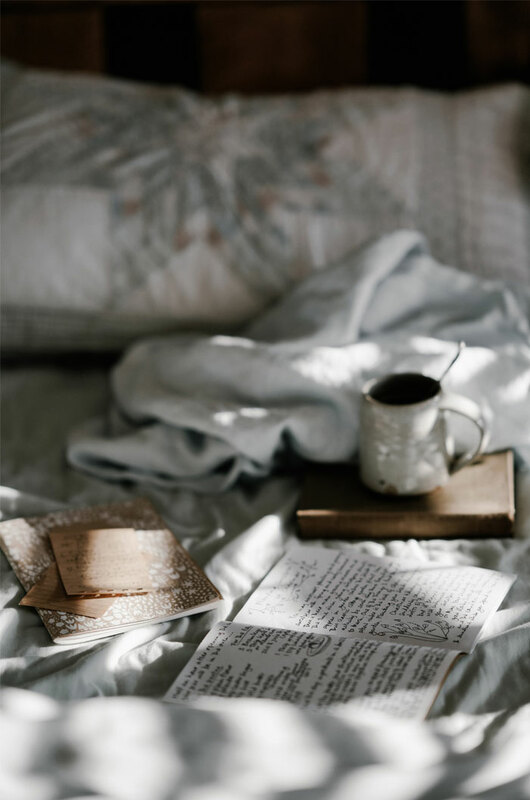 While you may not be one to hit the snooze button, it is likely that you'd much rather stay snuggled under the warm blankets in the comfort of your pajamas for the day avoiding it all. And by lunchtime, you're exhausted because you've been running since your feet hit the floor that morning. There is no joy in any of that. 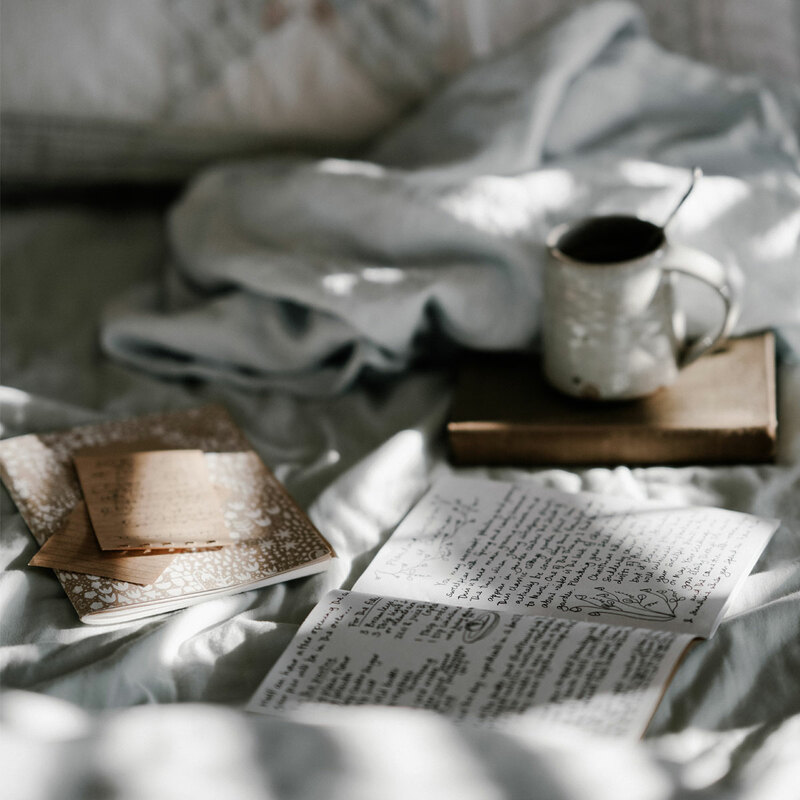 Creating a morning routine gets you out of the mode of simply surviving and into the mindset of being productive and efficient for the entire day. Can you imagine how good that would feel? How much more peace you would have from knowing that you are in control of your day and not the other way around? Just a few simple tweaks to your normal routine can set you up for great success, not just in the morning, but for the days and weeks ahead. We've all heard that breakfast is the most important meal of the day. Having something that fills you up fuels you for the activities that lie ahead. You don't need to sit down to a stack of pancakes, a couple eggs, toast, and bacon every morning. And you probably don't have the time for that either. But eating a small bowl of cereal or frozen waffles while standing over the kitchen sink as you prepare to rush out the door likely is not enough to sustain you until it is time to eat again. Stick a breakfast casserole you made the night before in the oven as you get dressed. Prepare a coffee cake with antioxidant rich blueberries. Or enjoy a plate of the best scrambled eggs and toast. Whatever it is, the act of sitting down at the table to a real breakfast gets your morning off to a calm start and fuels your body for the rest of the day. I hate feeling like I'm behind from the very beginning of my day. And I hate having a list of things that I need to remember to do the next morning on my mind when I go to bed. I've found that preparing for the next day as much as I can the night before has done wonders for my mood and what I can get accomplished. It also allows me to get a better night's sleep. Set the table for breakfast. Put what you'll need to make breakfast out on the counter. Make sure that you've got your purse filled with what you'll need when you leave the house. All these things take just minutes to do, but having them already done eliminates that feeling that you could be forgetting something as you're hurrying about. On Fridays, I plan my outfits for the entire next week. I make sure that the clothes I want to wear are clean, ironed and hung on hangers in my closet along with whatever accessories I'll be wearing. I'm no longer frantically searching for something to wear 15 minutes before I need to leave for work. It saves time doing it all at once, rather than heating the iron up each day for one shirt. And it has made me much more intentional about choosing complete outfits that I love rather than settling for what is ironed at the time. If working a week in advance is too much for you, at least plan and prepare your outfit for the next day. A to do list for the morning is just as important as a to do list for an entire day. If you don't have a good idea of what you want to get accomplished, you are more likely to accomplish nothing at all. Mornings are a great time for picking up around the house. Washing the breakfast dishes. Doing laundry or catching up on the ironing. Maybe each day you do something different. Maybe each morning is the same. But you need to have a plan when you go to bed each night of what your goals are for the morning. It clears your mind for a good night's sleep. And it enables you to get right to work without wasting the time weighing how your time could best be spent. It is the simplest of tasks. But taking a couple minutes to make your bed in the morning sets the tone that the day has started and you are going to be an active participant. It helps your room look tidy and makes it clear that crawling back under the covers is not an option. People now seem to be training themselves to NEED their cell phones. They NEED to stay in contact. They NEED to know what everyone else is doing at every moment of the day. And that has made us unfocused, unmotivated, and not as happy as we could be. Social media has a way of making you discontent with your own life and home when you start seeing those perfect pictures that everyone else is showing and you look around your home to see a pile of dirty dishes and toys scattered across the floor. Your inbox could contain problems that someone wants you to fix, advertisements for things you don't really need to be buying, and negative news. Ease into your day as peacefully as possible by staying away from the temptation to be brought down. Once you've gotten the day started on a positive note, all the negative is less likely to harm you. It never fails that the morning when you are running late is the same morning that you can't find your keys. Or your child realizes they didn't have you sign their permission slip due when they get to school. Or you forget if you shut off the coffee pot and have to turn around and come home. There is a lot to remember and a lot to do each morning when you are leaving for work or to take the kids to school. But allowing yourself a small "margin" to your morning, even just five minutes, gives you a chance to get all those things taken care of before the rush out the door begins. 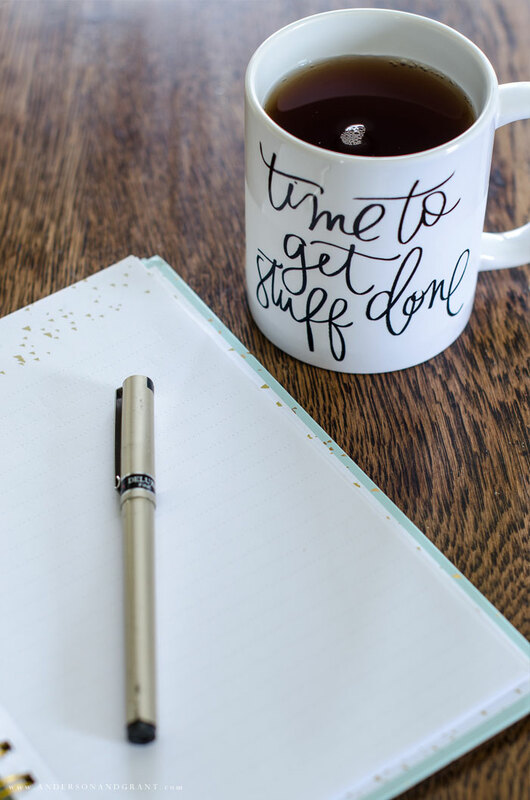 Those few minutes won't make much of a difference to what you can get done in the morning, but they sure will make the transition into your day must less stressful. I hope that some (or all) of these tips can help you to begin your day peacefully and efficiently. Setting yourself up for success from the dawn of the morning has incredible power over how you will feel as your day comes to an end. Agitation and impatience are less likely to creep in when you've been able to get a calm start. And before long, you will feel as though you are thriving as the day moves along rather than just surviving until it is over. 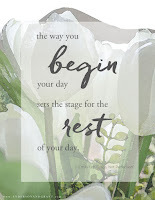 Need a helpful reminder to begin your day calmly? I've created three different printable versions of the quote I shared in this post that you can download for free.